Navigation: Home » Uncategorized » Happy belated birthday, Abraham Lincoln! Happy belated birthday, Abraham Lincoln! 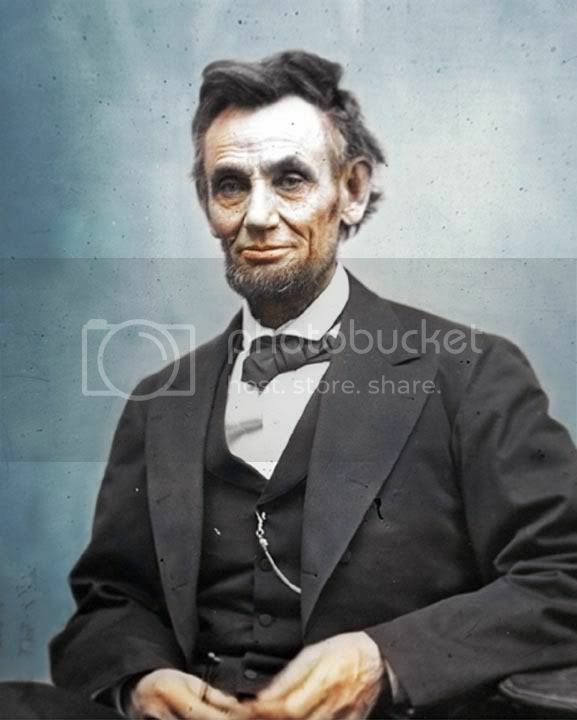 February 12 was Abraham Lincoln’s birthday. It’s also my mom’s birthday. Today is February 14, known in some circles as Valentine’s Day. I myself don’t celebrate Valentine’s Day. Oh, sure–I purchase the mandatory 22 or 23 valentines for my daughter’s classmates. I don’t want her to be outcast from her classmates. But that’s the extent of the festivities. I suppose the fact that my wedding anniversary is four days before February 14 has something to do with my non-celebration, but then I purposely planned a February wedding so that our anniversary would overshadow Valentine’s Day. If you’re single, February 14th may make you more painfully aware of your singleness. Valentine’s Day typically means much more to women than it does to men. It’s sort of a litmus test for men to try and prove their devotion to their significant other based upon how much (or how little) thought went into selecting the gift. I think we put too much pressure on the guys in our lives. Especially on Valentine’s Day. Having worked in an office for several years, it’s been my experience that the majority of my female coworkers would prefer flowers be delivered to the office than have them presented by their husbands or boyfriends at home. That always bugged me. It’s like it’s not enough to show the woman how much she is loved. A man is expected to show everyone else as well. People spend millions of dollars each year on flowers, cards, candy and other gifts meant to express our affection for those we love. I just think that money could be better spent throughout the year. Thank you, my friend! You made my day. Several years ago a man I was dating sent ‘the flowers’ to my office. I quit dating him. Anyone who thought it was a good idea to send flowers to the office or V-Day or any day was not someone I wanted to get to know on a more intimate level! I completely agree. I’ve always wondered why people need to be reminded to show their love to someone. My birthday lands just 10 days after & our anniversary just 5 days after that so I don’t celebrate it either. My favorite movie of all time. Seriously. Peyton was with us at the jewelers when I turned to Dane and said “Cool. We both got something and we didn’t have to spend as much as we thought” and then he said “Ya wanna just call this Valentines for each other and be done with it”? I agreed. Peyton rolls her eyes and goes “Wow guys, TOTALLY romantic”. Bless her little snarky heart. But even as happily married, I find Valentines to be so lame. I have no idea why. I think it stems from my annoyance that people need to be reminded to love each other and if you don’t give chocolates and roses, somehow, you aren’t in love. Boo on that. And happy birthday Abe. I’m a big fan of your works. And of the $5 bill too. OK, this is going to look like a Jesus Juke and I don’t mean it that way. 🙂 This is just how I look at Valentine’s Day. It’s a day that when I was single just wasn’t meant for me. Just like Mother’s Day isn’t meant for me. Like Father’s Day wasn’t meant for me before I had children. Sometimes, yeah, it was a little hard on those days but I would celebrate my friends who had received the blessing I hadn’t yet received. I love celebrating Valentine’s Day with my sweetie. We order take out from the restaurant we had our first date in (because they knocked the place down and built a fancy place where you can only get their pizza on the take out menu, not in house) and pick a romantic DVD we saw together when we were first dating or engaged. Sometimes we go to Denny’s for coffee like we used to late at night after seeing a movie together before we were married. I am glad we celebrate Valentine’s Day in our own way though, and not as some commercial suggests. Best combination of Abraham Lincoln and Adam Sandler since Happy Gilmore! Happy February 14th! There was a sort-of funny piece in the Post today. The columnist walked around a department store to test her theory that Valentine’s Day is an adventure in the five stages of grief. That story appeared alongside another of a couple who had been married for more years than my mother’s age; their secret was observing every day as Valentine’s Day. Thank you for observing Lincoln’s birthday; not too many do so in the great state of Virginia. I wonder if Mary Todd and he exchanged valentines.